Boy, was I living in the dark when I bought my first travel trailer! I had absolutely no business visiting that RV sale at the fairgrounds in Tucson last May. No business at all. Long story short, I walked out with a brand new 28' 2013 Shadow Cruiser travel trailer and then had to go find a truck! Luckily for me, I have not rued the decision to jump into the RV world. In fact, to the contrary, John and I have had many fine mini vacations in our travel trailer and fairly inexpensive vacations too boot. Whether you own a travel trailer, a big Class A RV, a Class C RV, or my dream trailer, a fifth wheel, there are things that you need to have on hand for your camping trips. And, there are things you might not have even thought of, which is why I'm writing this Squidoo article. I figured I might as well give you a leg up about stocking your RV - you'll learn what you'll want to have on board your RV to maximize your comfort and usability. So, come along and see what I've uncovered in the 6 months since I've owned my Cruiser RV. Note: all pictures on Things I didn't know an RV needed are my own pictures unless they're items for sale on Amazon.com. 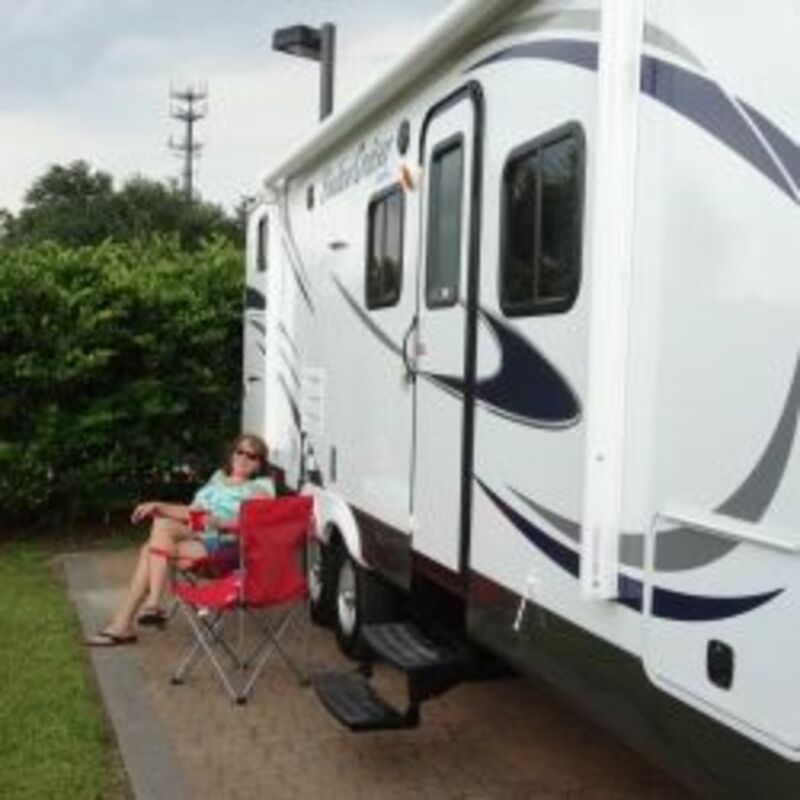 Edit: Since I penned this article, I've used and loved my travel trailer even more. So much so, in fact, that I started up a website of items I use every time we head out: GoodGiftsForRvOwners.com. Come see what interesting items I've found that might help you or your RV owner friend out. I put a crow bar into my wallet and replaced my flimsy RV mattress with the Parklane mattress you see there to the right. I read all the amazon reviews and liked what I saw. I also liked that this RV mattress is coils inside, not foam (memory foam is just not my friend). It's also super thick so it's really like sleeping on a nice firm bed. And, boy, do I like having it along for camping trips. I get such wonderful sleep now and wake up feeling refreshed and raring to go. Now, being of a certain age (ahem), I suffer hot flashes and night sweats so no mattress in the world is going to be cool without a cooling mattress topper. That's how I found the Double Plush Bamboo mattress topper you see there to the right. 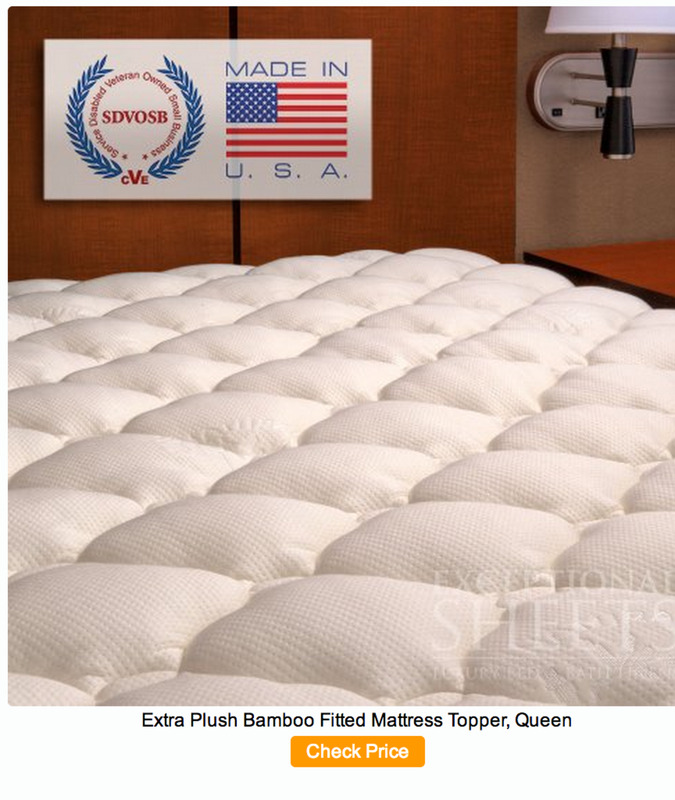 (You'll need to click that link to see the bamboo mattress topper in action. The thing is wonderful! Most reviewers (myself among them) love the cooling ability of this mattress pad topper. And, since John likes a softer mattress, this mattress pad added just enough softness for him while keeping the bed firm enough for me. This cooling mattress pad topper doesn't come in Queen short size so I bought the regular Queen and hoped for the best. With really nice, deep elastic sides, it molds to about any size Queen mattress. I made sure the sides wrapped all the way around. The thing haasn't slipped or even moved an inch. I love it so much that I bought the King size for my thermupedic mattress in my house. Reviewers note that it's like sleeping on a cloud, and they're right. Our Shadow Cruiser has a slide out that you can see there on the right. But, what it doesn't have is a small, protective awning to protect the top of the slide out from leaves, acorns, branches, etc. Especially when we are in a campground in the woods, it's imperative that the top of the slide out be clear of any impediments before we close it (we learned this the hard way - our slide out wouldn't come in one day - a branch was blocking it. Off to the RV repair shop we went). Note: the telescoping ladder you see in the link below is the exact same one I saw yesterday at the camping store. The difference? The camping store price was (drum roll please....) $253!!!!! Even if you're among the more active campers and enjoy trail hiking, rock climbing, or other physical activities when you're out on an RV vacation, at some point, you just have to sit your fanny down. And, it makes absolutely no sense to be sitting in an uncomfortable camping chair, so pay the extra money and treat yourself to a chair you'll look forward to relaxing in for years to come. As noted above, my travel trailer purchase was sort of impulsive (not 'sort of' at all - it was 100% 'what the heck did I just do' impulsive....), and I bought my camper in Arizona when I live in MD. So, the very first RV vacation John and I took was a rather ambitious one - we drove 2300 miles from Tucson, Arizona to Boyds, MD. I did have a few weeks to outfit the RV with the very basics we needed; Costco was my best friend. But, in looking back, the cheap camping chairs I bought there just were a temporary solution. They're not very comfortable for long time lounging, something John and I excel at. So, when we got home, I invested in the Picnic Time Reclining Camp Chair shown below. It's an outstanding chair at a much reduced price on Amazon.com than what I paid. This particular chair is big enough that I can sit Indian-style while writing. I love that. Here's a link to more camp chairs on my website: GoodGiftsForRvOwners.com camping chairs. Even if camping in an area where fires are not permitted, this portable campfire is allowed as it's run on propane. Just turn the valve and the fire is instantly out. It also puts out a good amount of heat and is quite portable and clean with the cover that clamps on. We also bought the little gas tank to bring along camping for those times when lugging the bigger tank was not feasible. To see more portable campfires and accompanying extras, come visit my webpage: Good Gifts For RV Owners, Portable Campfires. We've had our travel bar for a few years now and have found it incredibly handy. The one we own is that Picnic Time 2 bottle case below - that gives us a bottle of vodka for me and a bottle of scotch for John. When we bought the Shadow cruiser travel trailer, I knew that the travel bar would come in even handier. And, it sure has. These travel bars make great Father's Day, Birthday, or Christmas presents for anyone who enjoys a good happy hour. We just totally love our new portable ice maker - no more running out of ice, ever! Just fill with 3 liters of water, plug it in and turn it on. Within 15 minutes, here comes your first ice. Portable ice makers generally either make 28 lbs or 50 lbs of ice a day so you'll have plenty of fresh ice for those cocktails you're planning. For more details about the NewAir portable ice maker, check out my article: Never run out of ice again. I was turned onto the idea of induction cooking when a friend was making a huge pot of crabs on an induction cooktop outside. I was so impressed that I couldn't wait to get to Bed, Bath & Beyond with my little 20% off coupon. Let me tell you, Amazon is about 1/3 the price for the exact same induction cooktop. I bought an 1800 watt induction cooktop which is very powerful. Water boils in under a minute on the highest setting and soups and stews simmer gently on low. Since most RV kitchens are pretty small, a nesting cookware set just makes sense. And, if you bought that induction cooktop there above, you're going to want this Magma Nesting Cookware Set. Reviewers love the stuff so much that many people have actually mentioned they use it in their home kitchens also. It's extremely heavy duty and will work well in any environment so it's perfect for camping or taking on a boat. Note: induction cooking relies on magnets within the pots so not all cookware will work. When shopping for cookware, just take a magnet along. If the magnet sticks, you're good to go. I love the nesting cookware set for the camper as it gives me full functionality in little space. John just gave me this portable mister last week in preparation for my trip to Bayshore Campgrounds next week. We immediately set it up on our hot/humid balcony and....instant relief....I mean instant. The mist that this unit puts out is so fine that you can even use it indoors. Just add water and plug it in - no hose connection is needed. You can read more about the misting fans in an article on my website: The beauty of a misting fan. This portable mister is a must-have item for anyone who enjoys the great outdoors, in and RV or not. Our RV is parked in our backyard when we're not using it. Since the yard is sloped and it's important to keep the RV level, we bought two sets of these leveling blocks to put under the supports. The leveling blocks create a much more stable surface than just putting the support down in the yard. Also, since the yard is sloped, we have to use 5 or 6 leveling blocks at the hitch just to have the hitch meet the ground. These are inexpensive and are great to have along any RV trip. You know how your RV might wobble a bit when you walk in it even if the stabilizers are down? Well, our's sure did - especially with 4 dogs along for the trip. Every time one of them would turn around in their bed, we're rock and roll. That is, until we bought these tire locking chocks. These chocks work by putting very slight pressure on the tires - you just snug them up to the tires. No more wobble. At all. These are well worth the money. Here's a few of my other RV related articles you might like. These articles are geared toward those of us who have stepped outside our comfort level with the purchase of an RV. Did I mention that I tried for ONE FULL HOUR to back the sucker into the first campground? Oy. Anywho - here you go! This drinking hose is heavy duty and well worth the price. I've had this exact same hose for a year and a half now and it hasn't had one leak. I did not realize that one shouldn't drink out of a regular garden hose - as, well, I've been doing it 50+ years now. Regardless, evidently, it's not a good idea. So, I bought this Camco drinking hose. I like it as it feels more sturdy than the last white one I had that sprung a leak on day two. This drinking water hose has lasted me a year and a half now. Just make SURE to keep it separate from where you store your sewer hose. It's also a great idea to carry a small spray bottle with bleach/water combo and spray the ends of the hose and the tap before attaching it. 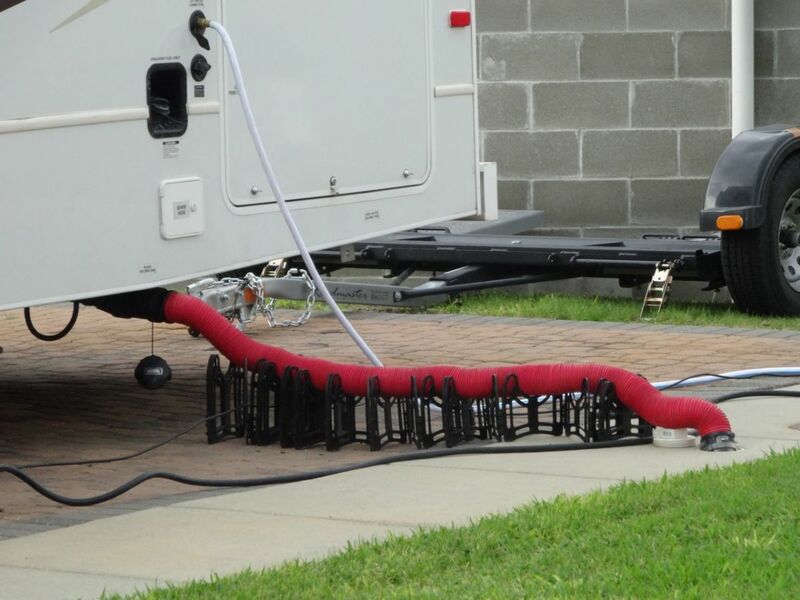 The very first thing we lost on our RV trip from Arizona to Maryland was the bumper covers and the sewer hose – shoot. This is a pretty typical happening it appears. So, we had to purchase a new sewer hose our second day out in our new RV. Luckily, we've managed to keep this one for a year and a half now. Camco makes a nice sewer hose. It's the one we bought at our replacement and, for what it's worth, the Camco sewer hose is much more heavy duty than the cheap one that came with our camper. If you're camping at a site with a sewer hook-up, you're going to really love these sewer hose supports. They allow a steady downhill flow from your camper to the sewer so waste water and sewage drains out much more efficiently. And, the best part of these sewer supports is that you 'set it and forget it.' It's ready to go every time you open the gray water or black water drain. I love to hear from the people who wander across my articles. Please leave me a short note to let me know you stopped in. Dont forget the heat tape for water hose if the gets below freezing. Wow !! That’s a lot of information, me and my husband is really thinking about buying one too, after he retires, it’s a lot of stuff to think about . Thank You for the very helpful info. Bought our first RV today. Plans are to live in it while building a home. Pray for a mild WV winter! Thank you for all of the great tips. Wow, what a lot of information, all necessary, I am sure. My family had a pop-up camper in the 1970's, in which we took several trips, the longest, 30 days from Indiana to California, and Washington, and back home. I have really wonderful memories of it. Thanks so much for your kind comment, Denise! We are actually about to sell our RV, being in competition during the summer with our boat and WV cabin. Just no time to enjoy it! But, we sure did have fun and will return to the RV lifestyle once my husband retires. Thank you for taking the time to share your experiences and knowledge. We will be purchasing a 5th wheel in 2019 and we are soaking up all the information you have been so kind to post. We will be doing some major traveling and because we didn't have time when we were younger to sniff the roses. We are getting another opportunity with retirement just around the corner. Please enjoy life and do lots of laughing! Thanks for that tip, Don! Screens to cover furnace and hot water heater grills! I didn't even realize that article was still alive! I haven't written here in a year or so. Thanks for the comment! for spices, flour, sugar, etc...save used plastic bottles with screw on tops to take just a sampling and not more than you need. I'm right over in Poolesville! Great posting on RV needs. Happy trails! We just got our very 1st travel trailer much smaller than yours and it's 5 of us plus a small dog. lol We will be trying to full time RV-ing in a few weeks, no real studying on it and actually almost spur of the moment, we currently rent and it was month to month, living here in this house hasn't allowed us to progress so I decided to do this..wasn't hard talking my husband into it as he travels (in our state) for work anyway, this will save on motels and all. Excited to start our new memories! thank you so much for sharing this info has helped. We just bought a new 26' Keystone Bullett. The sofa hide-a-bed has a flat panel in front held by two screws. I wondered what was behind it. When I took it off I found 15 cubic feet of carpeted storage. I replaced the screws on the panel with Velcro strips. I was wondering who I could share this with. Thanks. 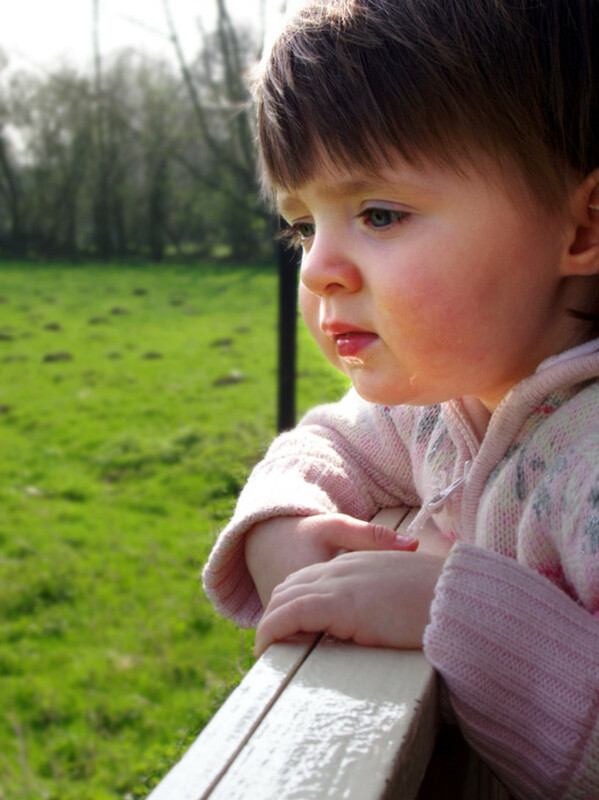 The best investment you can make is a dehumidifier Your windows will be clear and you won't have mold. 1.) Tires - the ones they come with are usually also-known as "China Bombs". They last maybe 2000-3000 miles before reliability will become a major issue. If you don't recognize the name, upgrade to a Carlaisle at a minimum, Goodyear, and Salun makes the best ones. We had our first blow-out at maybe our 6th or 7th trip, the thing just came apart. We were lucky it happened in a safe place to change it, and the damage to the under-body of the coach wasn't severe and fixable (by me) at our next campsite destination. Could have been much worse. We got rid of that junk as soon as we got back. I had a good price quote from SimpleTire.com but the local tire shop matched it (half what their asking price was). 3.) The steel stairways are junk, we all hate them, you can also replace it with a nice aluminum one that doesn't bounce the trailer up & down as you climb in - see MORyde Step-Above (also at Amazon). Thanks everyone for the wonderful comments! I'm not very active on Hubpages any longer, having started up 6 websites! I appreciate the comments though. Your advise is great if you’re always in a stall with full hookups. Not exactly camping in many folks minds. More important than an induction cook top is a great bbq, more important than an expense mattress is a great duvet, more important than a sewer supports is a great shower head that reduces water usage. Thanks for the valuable information. My husband and I are getting our 1st travel trailer in the spring of 2018, when I retire. So we are gathering information. I enjoyed reading your article, great information. Thanks. A small electric space heater sure saves on propane. I figure I,m paying for the site why not use their electric instead of my propane. Your blog was great, on our 6th trailer and would have thought that I figured out what to pack. Opened my eyes again especially about the Parklane Mattress. Doing research to prep for full-time RVing in about a year. Your blogs are so helpful! We just bought camper #2 and went from 29ft including hitch to 34'11" including hitch. This was our retirement bucket list #1 item. This has so much more than our 9 year old unit and 2 large slides. We have pets and I have MS so we like having our own space when we go somewhere or to visit. I don't always rest well nor do the dogs. It is so nice to have our own space. Love some of your tips that we to learned in the school of hard knocks. Thank you. Enjoyed the article my husband and I are long time campers, but always looking for upgrades. Really like mattress topper. My advice, and the kitchen tool I use most is a cuisanart electric fondue pot, why you ask? Instead of using gas stove to boil water for pasta etc, I use my fondu pot. You would be surprised at all the ways it comes in handy. useless article. Just pushing products to be bought. I hope they rewarded you for all the advertising of their products good luck. Thanks for the tips. We are thinking about getting one. This helps! Our most important purchase has been a Premier AAA membership. Those people are amazing when you are in a jam. My Husband and I were surprised that when we purchased our trailer, it came with a spare tire, but no jack! Thankfully we didn't find this out while on the side of the highway! Thank you for the article, the list, and the links! Much peace of mind gained from it! And much has been bookmarked, lol. The links and info are up to date. And I've seen a lot of these products in use when I've driven through some RV parks - now I know what they are! Thank you, and best wishes to you and yours! My husband and I are looking into RV life. Thanks for sharing your knowledge! Moving towards getting my Travel Trailer. ..I'm down sizing and I'm so excited! Ready for full time Rving. I figure by April I'll be ready. Learning all I can and this helps. Wow! We just bought a 25 ft travel trailer after years of tenting and a pop up. In the past year we have purchased every item you had listed except the ice maker( maybe soon! ). Some things we figured out in our own, like the induction cooker and comfy chairs! Some things we have added that you don't have on the list-a portable tank for emptying the black/grey tank mid camping trip, a 7-gallon fresh water container for quick rinses or drinks. This sits on the sturdy 6-ft resin folding table that we have next to the camper with a large clear tote that holds napkins, paper good, cutlery, etc, so we don't have to go in and out of the camper. A large camp rug is a necessity to keep the dirt out. Our dogs appreciate that! We will learn as we go along but your article is a great source for all campers! Thanks for the links for purchasing! If you have the availability of dumping at home (overflow pipe in yard), dump sewage at campsite. Then partially fill blackwater tank with water and head home. The sloshing loosens things up. When you get home, dump again. Then put bottle of toilet treatment and just a little water back in tank. Hope this helps! Love our ice maker. Also have a collapsible pub table and folding chairs which stores under the bed. One more handy thing we use every time we camp is a screen room - easy to put up and take down. Nice for out door sitting especially in the evening. Maureen go to Wal mart - to the RV section- they have special little packets of orange scented dissolvable which go straight in the holding tank. We use them all the time. They truly work even in the hottest weather. Hi there, you have some cool gadgets! Never heard of a portable ice maker. I have a question. Do you have any toilet tips. I feel like no matter what I do my ShadowCruiser bathroom ends up stinky!! Please let me know if you have any magic tips! Wonderful article, the round shop fans work wonderful to ward off these Virginia bugs too. Getting ready to go RVing is really no different than moving into a new home. There are simply some things you need and others that are what we think we need. We've been full time RVers for over 12 years and there are definitely some things on this list that are a must. The only thing I disagree with and that is a personal first-hand experience choice is the type of raised sewer support. We prefer something different because of this support doesn't always stay up especially in a wind. 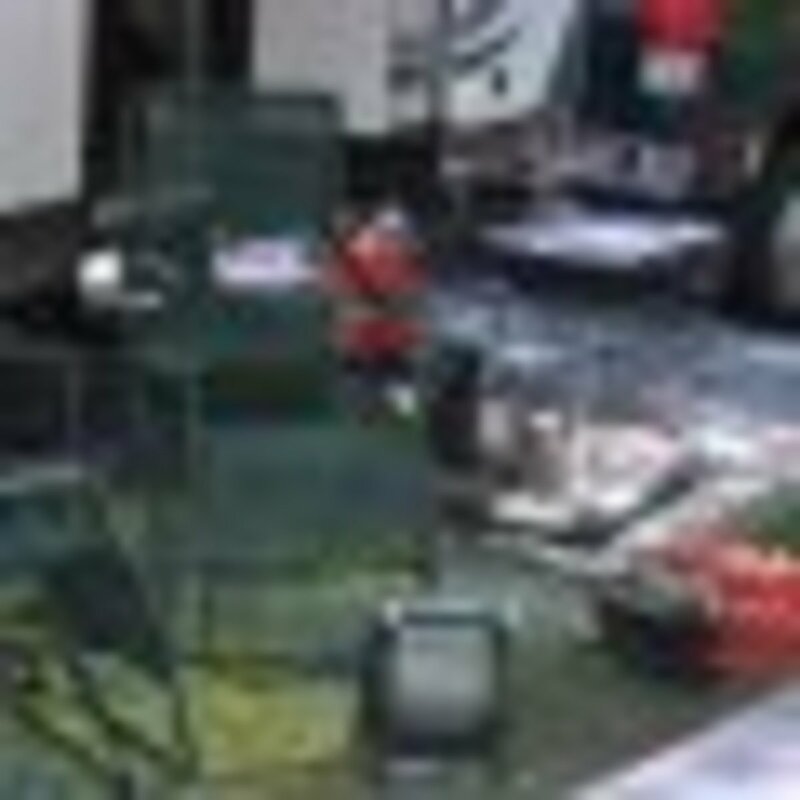 We throw ours out and have watched other RVers do the same thing. The wheel locking chocks are great and do cut down on the movement of the rig. And leveling blocks are a must have. I don't like memory foam either. Good tips! We rv 99% of our time in the hot Arizona summers so one thing I can say has been invaluable for us to have is a crock pot! Being able to set it and forget it and NOT heat up the rv by cooking with the stove or oven is a godsend when it's 115 degrees outside. And having a hearty meal after being on the Colorado river all day is necessary, since we usually just snack all day... And now that I know there's such thing as a portable ice maker, life changing!!! Little Red Campfire is great. We have one and absolutely adore it. My husband made his own leveling blocks and locking chocks. We recently ordered a folding ladder and can't wait for it to arrive. We love to go camping in our 30' OutBack Travel Trailer. Camping is so much fun and mos of the fellow campers are friendly. Glad you are having fun in your RV. I have always been curious about a holiday in an RV - looks like a lot of work! But very rewarding. I have dreamed of owning an RV. Now I know what to do and what not to do. Thanks for sharing your wisdom. And as for your hub. Would you believe I opened all your bookmarks, and I have put the Ice maker, and the burner on my wish list - and I want them now!! OMG! I surely wished that my mom did NOT give away her fifth wheel - I would have been traveling in it now. I stayed in it for 3 months, Nov-Jan, in 2010 when I got my divorce. It was in Brooksville, but it sure was windy and cold in Florida that Winter. You are so right about the collapsible ladder - I saw one of those when a fellow came to work on my roof. Everybody could use one. Happy RVing!! How I miss my caravan. They are superb fun and great holiday happenings. Enjoyed your lens and great tips. We just inherited a class C rv, now while that sounds awesome, and it is ...we inherited it from an aunt who drove it and never did anything to it.....no outside maintainance, nothing inside... so we have had to unbury it as well as spend a ton of money to bring it up to code....and everything has to be ordered from a company who does not take credit cards ( In this day and age?) so we have to send a check, wait for them to open it, pull the item and to ship it...the last order we made they sent the wrong part! Do yourself a favor guys.....read everything you can, plan for the unexpected and have a ball! We plan on using this trailer till it dies! Thanks for all the good tips.....and Happy Camping! I'm not an RVer but have friends that are. I sure did enjoy reading your article. The main thing I learned is... to leave my checkbook at home! Thank you for sharing. oh how I dream of the day that I can go to the state fair and to the RV sales section and walk out owning one! Never been in an RV, but it must be wonderful to travel around the country with it. Btw I would want one those chairs in my own home, they look great! I've been an RVer for several years, too! Great tips! I love the idea of blowing bugs away with a fan! Smart! And here I thought RVing was so easy! I guess all those folks who do it all the time just make it look that way! Great tips! Nice lens and informative for those who are thing of buying something. I never knew there was so much involved in RVing. Oh my! Great advice learned the hard way! Good story too. 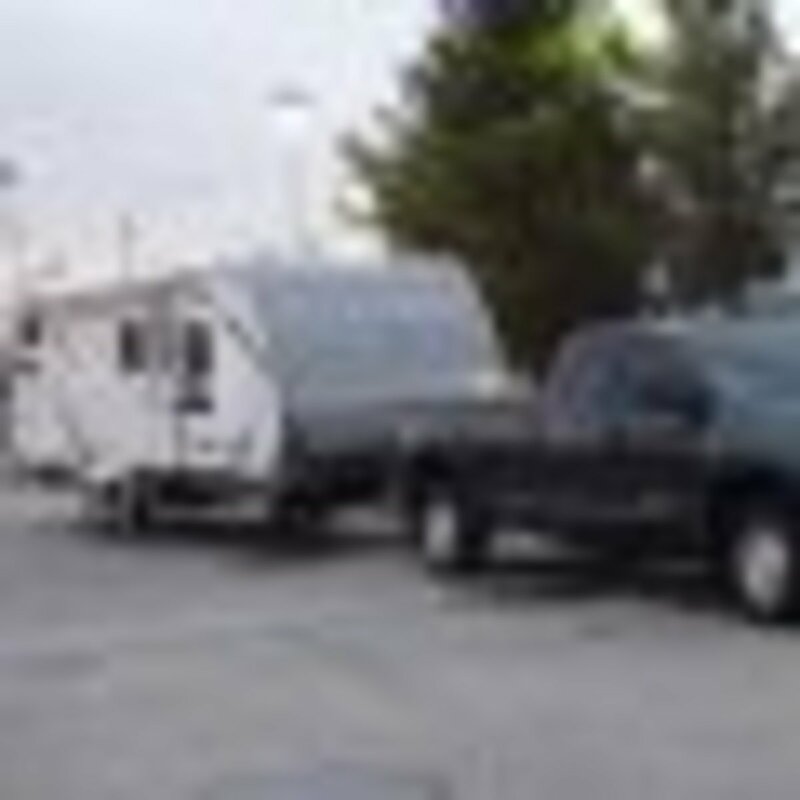 Excellent tips for new RV owners! The raised sewer hose is also important, since you are less likely to get punctures in the hose if it is up off the ground. We call ours the "slinky." We find wheel chocks important to have also. Wow, you have become an RV pro, Lori! So impressed!